Details have been revealed of a new event that has been designed to bring more visitors to Northumberland in the summer. Mestival will be a one day family friendly festival at Hesleyside near Bellingham, the ancestral home of the Charlton family since 1343. The event will take place on Saturday 2 July and attractions will include a 10K obstacle race in the grounds of the historic estate, along with live music, children’s activities, a tented village of exhibitors, and locally sourced food and drink. Mestival is being organised by Steve Cram’s company Events of the North, in partnership with William and Anna Charlton. 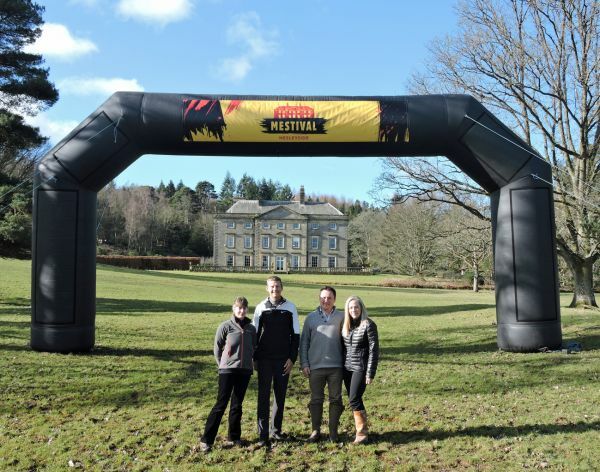 Mestival is the brainchild of North East athletics legend Steve Cram, who developed the idea with Hesleyside’s owners William and Anna Charlton, and the Northumberland National Park team. Central to the festival will be the 10K run that takes in much of the estate, challenging participants with obstacles and mud, while rewarding them with sweeping views and providing an exciting spectacle for other visitors to the event. Runners will set off in waves during the day and will start and finish in the festival village, which will be the base for Mestival’s many other attractions and activities. Youngsters will also be able to get into the thick of the action in a series of junior runs. Hesleyside is a historic family home in the heart of the national park, set within grounds that were landscaped by Capability Brown. The Charltons, who first occupied the land in 1157, built Hesleyside in 1343 and have played a significant role in the long story of the Borders, with the house providing a link to the lawless era of the reivers. Now the home of William and Anna Charlton and their young children, the land has been continuously inhabited by the same family, in an unbroken line, since the reign of Richard the Lionheart. For more information about Mestival and to book places at the event, visit www.mestival.co.uk, email info@mestival.co.uk or follow @runmestival on Twitter. To find out more about Hesleyside, visit www.hesleysidehall.co.uk.